The podcast of the beast discusses the Number of the Beast! The guys analyze Iron Maiden's 1982 classic, The Number of the Beast. The guys have a conversation with singer/songwriter, solo artist, front man of Wolfsbane, and former lead singer of Iron Maiden... Blaze Bayley. 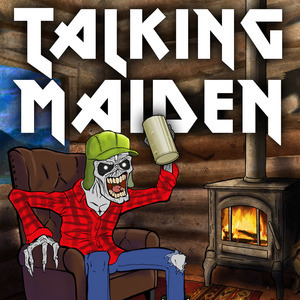 They discuss his time in Maiden, his current solo projects and Blaze's place in the Iron Maiden legacy. The guys wrap up their discussion of Iron Maiden's 2015 album, The Book of Souls. The guys continue their discussion of Iron Maiden's most recent album, 2015's The Book of Souls. The guys discuss the upcoming Iron Maiden 2019 Legacy of the Beast tour and all things Maiden! The guys discuss the some early Iron Maiden including the Maiden Japan EP, the Japanese Live!! +one EP, and contemplate the transition between Bruce Dickinson and Paul Di'anno. The guys discuss some Iron Maiden news, some tour date rumours, Bruce's book tour, The Chemical Wedding movie, and review the new Martin Popoff Iron Maiden Book. Plus, Nesbit plays a bonus clip from a very special bootleg. The guys continue their discussion of Adrian Smith, his solo projects, guest appearances and discuss their favourite post-reunion era Adrian guitar solos. The guys discuss Adrian Smith and his pre-Iron Maiden history, and discuss some of their favourite Adrian solos from his first tenure in Iron Maiden. The guys discuss some Iron Maiden news, Rock in Rio 2019, the newly released 1981 Iron Maiden Musikladen performance, Maiden Books, & some listen to some listener recommendations. The guys continue their discussion of Iron Maiden's 1995 album The X Factor! Due to massive listener demand... The guys discuss Iron Maiden's 1995 album The X Factor! We also discuss Blaze Bayley, Bruce Dickinson's Exit from Iron Maiden, and drink the best podcast beer so far!